Can I Claim Compensation For Slipping In Toilet? If I Slipped In The Toilet Can I Claim Compensation? Slipped In The Toilet Floor, Can I Claim Compensation? Slips, trips, and falls can be painful and even embarrassing accidents, having slipped in the toilet might be more embarrassing for claimants than other types of slip, trip, and fall injuries. Toilet floors are often wet with both water and other substances. As such, slipped in the toilet accidents and injuries can be more common than people may think. In this article, we will look at your rights when it comes to making a slipped in the toilet injury as well as a slip and fall compensation calculator. Claimants might even be able to make compensation claims for having slipped in the toilet on a wet floor even when there are no witnesses. Claimants who have slipped on a wet floor in a toilet cannot make an accident claim simply because they have had a fall. The claimant and their solicitor will need to show that there is a part who has a liability and who owned the claimant a duty of care. This could be the owner or operator of a restaurant, bar or other public space, or it could be a workplace. It needs to be shown that someone is at fault in some way and that the party must have been reasonably able to rectify the situation, preventing any accidents or injuries from occurring. The ‘reasonable’ definition is very flexible and it can depend upon factors such as how busy the toilet is. The ‘Occupiers Liability Act’ can usually be applied. The act imposes a duty of care to take all reasonable steps on the toilet owners to ensure visitors are not injured in the toilet. Your solicitor will need to show that the responsible party failed to take the necessary or reasonable steps. 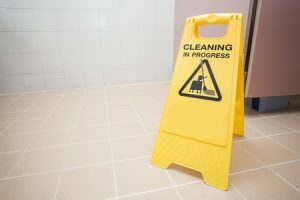 As with any slipped on a wet floor at workplace injury, if you have slipped in a toilet at work you may be able to make a claim against your employer. The same legislation which protects people in public toilets can also be applied to workplace toilets. The first step claimants should take is to report the accident to the workplace and record it in their accident report book. Claimants should also photograph the toilet floor, clearly showing the wet floor. Even if there are no witnesses, your solicitors can gather evidence such as cleaning logs to check when the toilet was last checked or cleaned. If the toilets are not cleaned often enough or had not been cleaned for a while, this may serve as evidence of negligence. Claimants who have suffered a slipped on a wet floor injury at work should contact a solicitor as early as possible. What Reasonable Steps Should Have Been Taken To Prevent Accidents? Reasonable steps which can expect to have been carried out include having an appropriate system of inspection and cleaning. If you have had a slip or fall and there was no wet floor sign, this could be indicative of the operator not having taken reasonable steps. Checks should be carried out at regular intervals to check the condition of the floor. May toilets do so on an hourly basis and there should be a check sheet in place to show inspection times as well as whether the inspection was carried out. Cleaning should be carried out and signs put in place when needed. If these are correctly filled in, it can sometimes make your claim more difficult, and their ability to defend against the claim easier. Your first step is to talk to an experienced personal injury solicitor who has the knowledge to work on a slipped in the toilet injury, as well as helping a claimant to reach their maximum claims potential. These claims can be complicated and securing the maximum amount of compensation, or succeeding in the claim requires the best legal representation available. Below is a table with examples of slip and fall injury settlements amounts. Please note, the list of injuries and awards below is not exhaustive and there are other types of injuries people can suffer when slipping on the floor in the toilet. Leg Injury Serious-Moderate £21,750 - £104,100 More serious leg injuries leading to restricted movement, disability or life-long problems. Knee Injury Serious-Moderate £20,250 - £33,200 Including damage to the knee, muscle damage or other leg injuries. Hand Injury Serious-Moderate £22,500 - £47,750 Injuries to the fingers leaving the claimant with reduced functionality in the hand. Wrist Injury Severe - Mild £2,550 - £44,500 Serious injuries include total loss of function in the wrist. Elbow Injury Serious-Moderate £29,200 - £42,250 Serious injuries, such as restricted elbow movement. Arm Injury Serious-Moderate £30,100 - £99,750 Severely restricted arm movement, leading to a disability in the arm. Neck Injury Moderate £29,600 - £42,300 Moderate neck injuries include lasting neck damage. Neck Injury Severe £35,500 - £112, 450 Severe neck injuries may include ongoing pain and impaired neck movement. Back Injury Minor £350 -£9,850 Temporary back injuries including sprains and bruising. Back Injury Moderate £30,750 - £8,750 Long back injuries including some loss of back mobility. If your injury type does not appear in the above list, contact the personal injury specialists at Legal Expert today for further information compensation claim award settlements. No win no fee agreements are also known as Conditional Fee Agreements, or CFA’s. They are a special type of contract which will set out the relationship between the solicitor and client. It details what work the solicitor will carry out on the case, what the client may be expected to do and how the solicitor will be paid. It should also set out that the client does not have to make any upfront or ongoing payments, and that if the claim is not successful, that the claimant would not have to pay solicitors fees. It will detail the fees the client will pay if the case is successful. This will usually be a percentage of the final award. By law, this can not be more than 25%. Conditional Fee Agreements are used to help people who may not otherwise be able to access legal help. The expert legal solicitors we work with at Legal Expert are based across the country and have years of experience in helping people to get the compensation they deserve. You can start your claim or find out more information on how we can help you by calling today on 0800 073 8804. Talk to us today to start your claims case. Find out more about making a successful accident at work claim as well as what you may be able to claim for in our guide. View the Health and Safety Executive (HSE) guidelines on how to report accidents in the workplace. Find out more information about the process of making slip, trip and fall accident claims.